After nearly 40 years in the crushed aggregate industry, Kafka Granite recently announced they would be launching a new line of Specialty Building Stone products. Watch the video below to learn how the story unfolded. Glenn Kafka, Founder: In 1979, I started in the decomposed granite business. Bought a quarry. 40-acre deposit, and I started bidding road projects and what not. I was moving this rock; it was probably 12 feet in diameter, and I got so far, and it fell back against the blade and it hit it hard, it jarred me, and voila. It glittered. Not quite to this effect, but it did glitter. It had, it had some mica in it, and it was what we call dynamite orange to this day. It sparkled. And I’m like, “wow; It would be awesome if we would crush that and make a decorative aggregate.” So that’s kind of how I had the idea of crushing different colors. 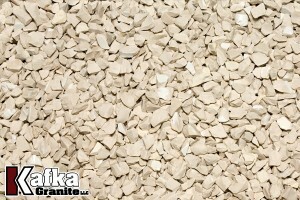 Today we have 60 different colors of aggregates, and we collect them from Canada and throughout the U.S. I did not find this mica-enriched quartzite. I searched for years, looking for aggregates, but this one found me. It sparkles, it glitters. The colors are amazing, are vibrant. It’s just, like, something you’ve never seen before. The colors. There are so many colors that I haven’t even brought here yet. I’ve never seen anything like this, it was like a red, and a green, and this black, and it just sparkled, and glistened, and it was amazing. And it’s something that nobody else has. It intrigued me. I said, why don’t we market the glitter stone in a thin stone veneer? That would be something that nobody has. A week later I was up there, and a month later I owned it. Jason Hestekin, Director of Dimensional Stone Division: So I talked to Glenn 20 years ago about his products, and back then I already knew what was, what was different about what he did. Kafka does things one way, and it’s a top shelf. And part of being Kafka is blazing the trail and setting a new bar. I’ve worked at a few other quarriers. I’ve been out in the yard, I’ve been in the fabricating end of it, I’ve been in sales. From residential, commercial, agricultural; homes that are bigger than most commercial projects. Just some incredible things that you just to see. You see things because you’ve seen so much. And you’re not afraid of “can you, can’t you,” whatever that looks like. Yes. We can do it; there’s a way. We have proven for a long time we can do a lot of things, and our aggregate industry, we are ready. We are doing everything we can to be a building stone supplier. Glenn: As far as the quality, we actually have a jump on that because we’re taking a piece of stone that is this large, and we’re trying to make that perfect. What we’ve done in the past was taken that stone and made it into a million little pieces, and had to keep that quality. Jason: It is so specific. Can you do that in building stone? That’s crazy. Nobody has that type of specification; that type of requirement. And we’re already exceeding that? We got this. The most exciting part of all of this is, is it isn’t just one product or one specific material, it is a large amount of products that we already have that have an endless amount of opportunity. Something nobody else has. And it’s not one thing, it’s 10, 15, 20, 30, 40 different products that nobody’s never seen. And we’re going to bring all of them to the market. The launching pad for Kafka’s building stone is our Glitter Series. We will launch with a couple of specific colors, and as we continue to work through that quarry, we will bring other Glitter products to the market. This mica-enriched material is unbelievable, and you have this big “Wow! Holy smokes, I have never seen anything like this before.” It defines what you want to do, which is, nobody else has it so it’s unique, it’s top shelf, it’s the best of the best. We can do all of that with so many other products we already have–that’s the turning point. So, you can also expect to see our Legacy Series, and that will be a combination of products from many other quarries that we own. And you can expect to see that immediately this year. Those products are things that are not out on the market that nobody else has. We can truly be a one of a kind. We’re creating our own market, and we’re going to lead the way with it. Glenn: I’m not getting in this business to compete with anybody that’s already in this business. That’s not my goal. My goal is this. To offer something that nobody else has–something that I love. And I want to show the world. With the mindset of quality comes first, and the product can never be good enough, that’s what we hang our hat on, and that’s where we’re focused on in the future. I believe that we’re barely scratching the surface. The possibilities are endless. Jason: We’re ready to roll. Kafka Owner and Founder, Glenn Kafka, is excited to share with his loyal customers Kafka Granite’s newest natural stone offerings. Having purchased his first 40-acre quarry in 1979, Glenn has worked tirelessly over the years to evolve and grow the Kafka name into what it is today. Amongst his first discoveries within that first quarry was an unexpected find; an orange granite with traces of mica in it. This aggregate was discovered by accident when a large solid boulder toppled backward and broke, revealing the dazzling surprise inside. This discovery inspired Glenn to wonder “what if we crushed down this stone to make a decorative aggregate?” And the rest, as they say, was history. Once the concept of crushing decorative aggregate was seized upon, Kafka began producing over 60 unique color variants of specialty aggregates, including Dynamite Orange Granite. And while satisfied with the results of his crushing endeavors, one day Glenn was approached by an individual looking to sell a quarry with some very unique features. Glenn wasn’t interested in opening another quarry in Canada, but it was promised to Glenn that this new quarry found in Northern Ontario contained something spectacular; multi-colored mica enriched quartzite. And so, after seeing a sample, a week later Glenn decide to venture out to go see the site. Once he laid his eyes on the quarry, he knew just how special it really was. A week later he sent trucks to the quarry to bring back raw material, and a month later he owned it! Glenn couldn’t help but think: this stone is far too spectacular to merely crush; what other products could we make of it? The stone found at Kafka’s newest quarry sparkles and glitters in glistening, vibrant hues, making it something that’s yet to be seen on today’s market. Glenn himself has admitted to never having seen anything quite like this new stone. Red, green, black, and more shades have already been discovered within this dazzling new resource. And while Glenn saw this potential for this product as a crushed aggregate, he also had the thought to use this one of a kind stone to make something completely new; glittering natural stone veneer. There are no comparable products on the market today that can hold a candle to our new stone’s brilliance and shine. At Kafka, we have always prided ourselves on the high product standards we maintain, and we knew that these specialty building stone products would have to live up to our established Kafka standards. After all, part of being Kafka is blazing the trail and setting a new bar. Our crushing facility produces some of the highest quality, speciality aggregates on the market, and we’re maintaining that same level of quality when it comes to our thin stone veneer and building stone. And we’re not just talking about one product; these high standards are being applied to our entire new building stone line, which will someday be comprised of a multitude of products. These new products have an endless amount of opportunity. Naturally, when it came time to decide on the launching series that we would use to introduce our new veneers to the market, the only name that seemed fitting was the Glitter Series. Launching with a few preselected colors, the line will eventually expand to encompass a wide range of sparkling colors as we work through our new quarry. But the Glitter Series will not be our only foray into veneers, our newly released Legacy Series will likewise be comprised of thin veneers and building stone. These new granite, marble, and quartz building stone products will be made from the same Kafka colors that our customers know and love. This high-end building stone will be ideal for any number of applications from building facades to interior features and will be available in a wide range of cuts and colors. We didn’t get into this business to compete with anyone else. We came to create our own market and lead the way. At Kafka Granite, our goal has always been to offer something that nobody else has. And whether that’s through specialty aggregates or veneers, we strive to ensure that our products stand apart from the rest. When it comes to our new veneers, we’ve barely scratched the surface of what’s possible. Make sure to stay tuned for future updates about our new veneer lines and the exciting products we’re turning out. Listen to how the story unfolded by watching the video below. Kafka Granite has always taken measures to help the environment. After all, we pride ourselves on the environmental benefits of naturally occurring decomposed granite in comparison with concrete or asphalt. Permeable paver grit, which contributes to groundwater recharge, and white roof options to reduce urban heat islands contribute to our portfolio of eco-conscious aggregates. Using sustainable materials in your next big project could give you points toward a Leadership in Energy and Environmental Design (LEED) certification. Creating a LEED-certified project is a reflection of your project’s minimal stress on the environment. It shows you’ve taken the environment into consideration from the design of your project to the material you used. One way to help earn LEED certification (and the trust of many earth-adoring people) is to use recycled materials as often as you can. This means using insulation from recycled jeans, rubber playground surfaces made from recycled tires, or even pathways or precast concrete fixtures made from recycled porcelain and fire brick —think outside the box for where recycled materials can be used in your project. Kafka Granite has teamed with Wisconsin-native businesses Wausau Tile and Kohler Corporation to stick to an impressive recycling initiative. This three-way relationship started when Kohler noted that its landfills were becoming saturated with brand-new toilets and sinks. These fixtures simply didn’t meet the high-quality standards of inspectors, so off to the landfill they went. Wausau Tile took interest in the discarded porcelain goldmine and approached Kafka Granite for its impeccable crushing facility. The crushed porcelain was to be used for a new product line that Wausau Tile was going to create, but another world of benefits was also unlocked. Companies like Wausau Tile can use recycled crushed high-quality porcelain in terrazzo flooring and as a unique component to decorative precast concrete. Its potential has also been explored and makes a great material to use in exposed aggregate architectural panels, pathway materials, and epoxy overlay streetscapes. Whistling Straits, the famous Kohler Company owned golf course, is even using their recycled porcelain as bunker liners using the Better Billy Bunker Method. Recycled porcelain is incredibly durable and absorbs minimal water, which makes it especially ideal for climates where continual freezing and thawing is common. Other materials adding an element of smoke or sparkle to quartz countertops everywhere are electronics glass and discarded two-sided mirrors. Thousands of outdated boxy TVs are tossed to the curb every day, but now the thick smoky glass could see new life by being crushed for other purposes. Two-sided mirrors are also seeing new life as they can add a reflective glimmer to be used in terrazzo flooring, countertops, or anywhere else crushed recycled mirror could add a unique touch. The depth added by these crushed materials gives new life to old, useless glass. Kafka also recycles some less obvious materials for crushed aggregate, such as copper slag. Recycled copper slag is a unique option that you can use as a recycled aggregate in your next project. Durable, attractive, and recycled, these options could help push you toward a LEED certification. But what exactly is copper slag? Copper slag is a byproduct of copper smelting. Smelting is the refining process that copper ore goes through. Copper ore is what’s mined from the earth, usually from quarries, and is a mix of minerals and rock. In order to extract the usable ore from the mineral and rock blend, the mixed deposits undergo smelting; the process during which the deposits are heated with an agent that triggers a chemical reaction that forces the desired metal end-product out of the ore deposits. The non-metallic dust, soot and rock are what make up copper slag. Copper slag is friendly to both the health of people, as oppose to alternatives like silica sand that is harmful when inhaled, and the environment. It also has an impressive strength-to-weight ratio, making it a durable, long-lasting option for different projects. Copper slag is primarily black in color with flecks of red and lighter greys, resulting in a pleasant and versatile aesthetic that is mostly used as aggregate in precast concrete to increase its recycled content. Many prestigious projects have utilized our copper slag recycled materials, such as Chicago’s Navy Pier. The designers on the project were looking for a material that could stand up to the test of thousands of visitors and rapidly changing weather, all while being made using recycled content. Our copper slag ended up being exactly what the project called for, and ended up being a large contributing factor that helped the final Navy Pier project received a gold SITES certification. Just like copper slag, firebrick is an eco-friendly material that can earn your project those highly desirable LEED points. But what exactly is firebrick? Firebrick refers to the dense bricks made to withstand intense heat. These bricks are usually found lining kilns, furnaces, and fireplaces. These bricks are designed to hold even under during rapid temperature changes; such as in locations with mercurial environments. When firebricks reach the end of their application, though, they could end up at a crushing facility like Kafka’s. Crushed firebrick blends have a great blend of light tans, greys, browns and reds. Such a varied yet neutral color palette and strong compaction characteristics makes crushed firebrick a great recycled option for pathways. Being environmentally conscious is never a bad thing, especially if it can earn your project LEED certification. Architectural customers as well as the eco-friendly consumers will benefit from using recycled materials in their next projects. 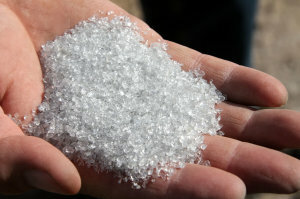 Instead of clogging landfills, these materials are being crushed to exact specifications to breathe unique life into many products like terrazzo floors, precast concrete, and even pathways. Kafka Granite has been pushing the environmental envelope for years and has just what you’re looking for when it comes to recycled aggregate. To get free samples or find where you can get your hands on recycled porcelain, firebrick and copper slag, contact us today. We’re waiting to help find the right aggregate for your project, especially if helps toward LEED certification. Why Is Rip Rap Used for Breakwaters? There is a certain majesty to waterfront property that is hard to beat. The serenity provided by the sound of lapping waves and gentle movement of the water makes for an idealistic setting for most businesses. Kafka Granite is fortunate enough to be surrounded by numerous bodies of water in the Mosinee area. With over 15,000 lakes in our home state of Wisconsin, we frequently receive calls regarding how to protect waterfront property from erosion. In these cases, we recommend rip rap breakwaters to those seeking multi-use landscape structures that are both useful and aesthetically pleasing. And just to note, we always tell our customers to refer to their state DNR shoreline regulations when considering making any changes to their property’s shoreline. In need of multi-use landscape supplies that are not only beautiful but functional? Rip rap is comprised of naturally occurring rock that has been broken into pieces ranging from 6” to 30” shards. Kafka Granite offers exceptional quartzite and granite rip rap in a vast spectrum of colors. Rip rap, sometimes seen as riprap, rip-rap or stone armor comes from the nautical word rip-rap, which in 1822 meant “stretch of rippling water.” Rip rap can be classified as either graded or uniform. Graded rip rap is a mixture of stones that vary in size and shape, whereas uniform rip rap is a mix of stones that are all of a similar size and shape. Records of rip rap can be found well before the 1900s. In fact, rip rap became one of the first forms of erosion control when it was used in the building of the Panama Canal in the early 1800s. Breakwaters are exactly what the name implies; they are offshore structures that protect property from the force of waves by breaking water before it reaches the shore. The first cited use of a breakwater was in 1769. Shoreline rip rap used for breakwaters serves many purposes besides being simply pleasing to the eye. Breakwaters made of rip rap help reduce erosion and absorb the force of waves. Without the use of breakwaters, waves can make a significant impact on shorelines. When left unchecked waves can both deposit debris along a shore or result in erosion. Waves will deposit sediment along the shore when the force of the wave dissipates before it reaches land, this results in layers of gravel, sand and debris being left behind. Erosion occurs when waves break along the shore and then carry parts of the shore back out to the water. It is estimated that wave erosion is to blame for the loss of four billion tons of soil annually, resulting in over $20 billion being spent on replacement soil each year. Shoreline erosion is a natural process that can occur in lakes, rivers, streams and along the coast. Many factors can contribute to shoreline erosion including storms, strong waves, rain, ice, runoff, winds, loss of vegetation and more. As mentioned above, over time shoreline erosion can present an enormous threat to your property’s value, structural integrity and present a serious financial obstacle, so it’s important to take the necessary steps to ensure your property’s longevity with the use of a rip rap breakwater. Rip rap has many uses; as landscape stone, to form a breakwater, as abutments and more. Rip rap can also be used as a beautiful accent feature or to build striking retaining walls. We are frequently seeing new ways to use this diverse landscape stone, with customers fabricating fountains, steps, benches, and more from beautiful natural chucks of stone. Anyone who owns land along a lake or riverway should first contact their local county, city, or township with questions regarding standards or permit requirements before starting work on their shoreline. Rip rap is an easy-to-use and easy-to-maintain landscape stone that is a very low-maintenance alternative to other traditional retaining walls. Rip rap should be checked annually or after any large storms to ensure that no stones have been displaced. You shouldn’t allow wooden vegetation to grow on your rip rap due to the eventual displacement of your stone from the plant’s root system. Wooden vegetation includes shrubbery such as willow and dogwood plants and smaller grasses such as fox sedge, rattlesnake manna grass and tall manna grass. A breakwater made of rip rap has another great advantage that you might not have considered—natural wildlife habitat! Traditional vertical seawalls offer no protection or benefits for the local ecosystem, but a rip rap breakwater provides an excellent place for wildlife to feed and hide. Once installed you can expect to see a whole new ecosystem develop around your property. Below are some further advantages of rip rap breakwaters. Rip rap is a great solution for those looking for an aesthetically pleasing stone for a large scale project, for both contractors and architects alike. No project is too small or too large at Kafka Granite. 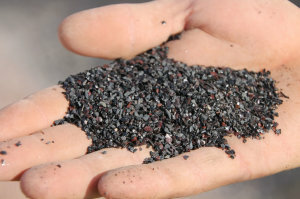 Additionally, while usually known for our crushed stone aggregates, we take pride in offering unique raw rip rap that shines in both form and feature. The natural colors found in our rip rap are sure to complement your next shoreline or breakwater project perfectly. Get in touch with Kafka Granite today to discuss your next rip rap breakwater project. Our rip rap selection is now available for online viewing. https://www.kafkagranite.com/wp-content/uploads/2013/11/midnight_blue_granite.jpg 400 600 Tiffany https://www.kafkagranite.com/wp-content/uploads/2018/03/KG-6-e1521664053657.png Tiffany2018-06-13 13:16:162018-06-13 13:16:38Why Is Rip Rap Used for Breakwaters?